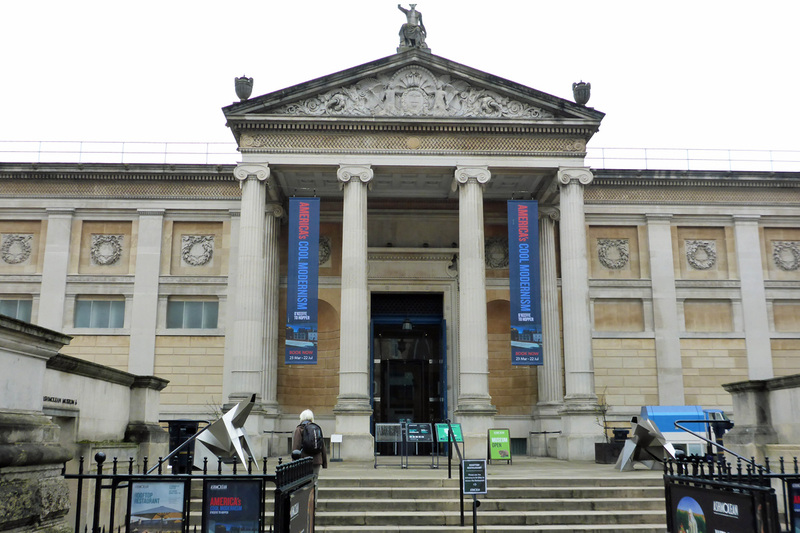 Lunch at the Ashmolean with Lawrence of Arabia & two ’Merican ladies, coffee with the man who inspired the intro to Queen’s We Will Rock You #narrowboat #England #Ashmolean #Oxford – The Diesel-Electric Elephant Company. Museum of Art and Archaeology, University of Oxford. Website here. Founded in 1683, open Tuesday to Sunday, and Bank Holiday Mondays, 10am–5pm. Admission is free but there are buckets by the door. What a splendid place. The Ashmolean is in receipt of The Cardinal Wolsey Seal of Approval (not a real seal, just bags of approval). With one exception (more of that later) it is a grown-up space and has successfully resisted the social tsunami of baby-friendly plastic bouncy nonsense. It is a proper museum, stuffed to the gunwales with lovely stuff that we’ve nicked over the years. Chief among this “the stuff”, for me at least, and constituting the basis of a quasi-spiritual pilgrimage, is what may plausibly be described as Mr Guy Fawkes’ lantern, the one that came oh so close, so very close to giving Parliament the kick up the Arsenal Villa that it needs more than ever today. Had the gentleman succeeded then there would perhaps, today, be no snuffling drift of “the pigs of politics” in Westminster, raising their filthy snouts from the trough just long enough to demand that the English tax-payer fork up cash on the order of between £3,700,000,000 and £5,700,000,000 to pay for the restoration of and sundry improvements to their sty. For those of you who deal in das Mickey Mousen money, that’s roughly between $4,932,086,994 and $7,597,924,363 at (the risible, uber-manipulated) exchange rates as of May 2018. It’s what we call “thousands of millions” and the residents of the U.S.of.A. call “billions”. Yes, for the restoration of just ONE building… if it were not so tragic I’d say that they were havin’ a larf. Back to the Ashmolean. There are treasures beyond counting in the Ashmolean. There’s the full set of drag once worn by T.E. Lawrence, he of Arabia, for a start. Lawrence of Arabia, Mr T.E. to his friends. Apparently he always looked like a damp sack of potatoes in his uniform, but revelled in this swishy outfit. I am more of a jeans and grandad-style cotton shirt wallah myself, but there you go, horses for courses. There is old Archbish Thomas Cranmer’s “band” which is what was used to confine him neatly while he was imprisoned for making a pact with the wrong sky-fairy, for which mistake he was later set alight a bit until dead. Incidentally, the spot (“ish”) where Mr Cranmer was reduced to ashes may be found on what is now Broad Street. I think that perhaps the heat of the fire damaged the tarmac, and it was mended by slinging down a few old tiles in the rough form of a cross. That’s what it looks like, anyway. Details here. A slap-dash road repair, or roughly the spot where Cranmer became toast? The Ashmolean exhibits are all elegantly conserved and displayed in the good old-fashioned way (I mean that seriously) – there’s not a touch-screen in sight, no neon plastic explaining in words of half a syllable that history is generally thought of as what happened in the past. It is almost all very delightfully and deliciously sober and sensible. The exception to his “deliciously sober and sensible” motif is what is termed “the café” (as opposed to the “the restaurant”, more and much better of that later). The café is a clattering, echoing, cattle-market of a place quite out of keeping with the rest of the museum. Holding court there is what I think is, these trendy, metropolitan, nerdy, hipster days, referred to in hushed, awed tones as a bah-rees-tah. The service in the caf’ is slow, so slow that between ordering “please, just a cup of ordinary coffee and a slice of Victoria sponge or something” and actually receiving the goods a chap might find himself becoming qualified for his State Retirement Pension where hitherto he had been in his prime. The long, long wait for coffee and a slice of Marie-Antoinette is made all the more dismal, not to say aurally painful, because the bah-rees-tah appears to see his primary function as being to make noise, lots and lots and lots of artless, unpleasant noise. Imagine being in a vaulted echo-chamber (already populated by crowds of geese-like hoi-polloi at full volume) while the first few bars of Queen’s “We Will Rock You” are played over and over and over and over and over and over and over and over and over by some chap armed only with the metal parts of a coffee-squisher and the metal edge of some coffee-dregs waste-disposal unit. These two serving at the cafe wotnot looked as fed up with the antics of the bah-rees-tah as was everyone else. Clatter bang thump bang bang. I have never before seen so many OAPs in one room all reaching in desperation to switch off their hearing aids to prevent their (remaining) brains being blasted out of the opposite ear, and all in the name of caffeine, cake and a sit-down somewhere, anywhere. The restaurant, on the other hand (and on the roof, far away from the idiot with the percussion fixation), is at the far, far end of the eatery drinkery spectrum. The great end of the spectrum. The Bro and I hove up there on spec, sans booking, and we must have looked as though we knew our fish knives from our Gazpacho spoons, because they found room for us at the communal “overflow” table – and reet glad we were that they did, thank you! The brilliant restaurant on the roof of the Ashmolean. Yes, it is actually on the roof, so you do even from indoors get a hint of the architecture of the rooflines of Oxford. It is all very civilised. The food is absolutely splendid – menu here and my cucumber & rosemary gin and tonic caused my knees to tremble with happiness. We sat on the foreground end of the bench table nearest the window, from which position we were able to converse with a brace of North American tourist ladies. I can only hope that we didn’t bore them to death, and say that I enjoyed their conversation and the first-hand details of that strange, strange land. The ladies were most surprised to hear that in England we no longer, upon being arrested, have a “right to silence” (silence now being taken as, effectively, evidence of admission of wrong-doing). The tourist ladies also thought that London (and other English cities) were amazingly clean and free from rubbish. The Greek and Roman gawds alone know what North American cities must be like then, because I always think that London is an untidy midden with a generous helping of non-house-trained rats. Obviously, where once we were merely separated by two entirely different languages (English and American) we must now add to the mix an extra portion of Social Gulf, with the U.S.A. marching towards the oblivion of national insanity while England totters unsteadily in the direction of “entirely gone to the dogs”. There could not have been a more fitting locus for such a conversation and comparison than in the Ashmolean, over truffle gnocchi and Hendrick’s gin. The museum stretched our minds back through the centuries and millennia, the conversation took us back and forth three thousand miles over an ocean. In short, at some length, do visit the Ashmolean and do take with you all of the time you can possibly spare. Visit it at your leisure. Revel in it, roll in it all the way a dog rolls in fox poop, soak up the history like a hairy Welsh Collie sponge. Make a booking for the restaurant (though perhaps skip the café unless desperate, or until someone muffles the baaaaah-reeees-taaaaah). You will most certainly not find the museum wanting – and I have merely mentioned two or three of the thousands and thousands of wonders held therein. I left a message with the Ashmolean to the effect that they were doing very well, very well indeed, and that I thought they ought to continue in this manner for the foreseeable. Mary Rose museum and the Ashmolean a great big Seal of Approval each, Blenheim Palace a big, fat, well-deserved zero. Books by Ian Hutson… available on Amazon and all good, bad or ugly book shops. Cheerio, And Thanks For The Apocalypse – COMING SOON! Hilarious! You have tempted me to purchase a copy of NGLND XPX. This kind of humour is sadly lacking in the Antipodes. Baristas are the epitome of wankery, bar none! … poor Tommy Cramer, if only he’d been able to hold out until the Original Liz came to power. God, we’re a brutal species aren’t we? Not that all that much has changed betwixt then and now, out tortures are just a bit more refined. It sounds like a wonderful place to escape into. Although perhaps it’s not an “escape”. I find the reminder that we have been variously idiotic throughout history quite dismal sometimes. Particularly when it appears we learn nothing useful from it. Indeed most of us are barely aware that there was anything before our particular narcissism. Oh well, I suppose I shall go back to watching us rush toward the insane climax of this particular plot hole in history. It is sort of mind blowing to realize that we are projecting a reality onto history that might be quite different than the one people living it experienced. Still, future historians will have billions of personal pictures of regular humans living their lives – both selfie culture and CCTV. Surely they will be able to fully grasp that we are fully insane as a civilization at this point. What I wouldn’t give to have that much visual to look at from 400 years ago or 1000 years ago! Imagine being able to see what happened on the streets of London 500 years ago. Another fine piece you’ve got me into! I fancied Cauliflower rice and red quinoa salad, I love a bit of pomegranite; I even had to view the other menus, I suppose some people would go for breakfast!